Tita Malu, as her beloved pamangkins (nieces and nephews) fondly call her.. is not only a generous aunt but a very thoughtful tita as well. She never fails to treat them for latest 3D movies, go shopping, dine out or just have a nice sip of tall or grande Starbucks's Mocha Frap. She's my younger sister, our family's most eligible bachelorette, highly career-oriented but with an undeniably soft heart. Her pamangkins always take advantage of her available time and whenever they get that chance, they just enjoy hanging out with their favorite Tita Malu. Every Christmas eve, the kids traditionally open their gifts from their tita aside from the complete wardrobes she bought for them from head to foot. That's why my other younger sister and I never worry about their outfits for the season. She has that fashion sense and style. 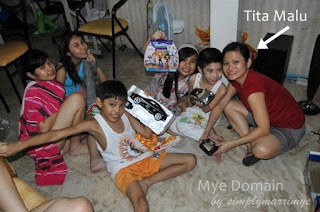 The kids so love their charming tita that they also dotingly call her SANTA TITA especially when Christmas comes. The season will never be complete without their shopping galore. She's like Santa Claus making their little wishes come true. And today, January 27 is her birthday. In behalf of the whole family, I warmly greet her a very HAPPY BIRTHDAY!!! May God continue to shower her blessings of good health and more wealth. May she find that missing piece in her life that will eventually make her completely HAPPY inside-out. Family seem happy ah. I would also love to have an aunt like her. - me, as spoiled niece haha. The kids are so lucky to have their Santa Tita and more blessings to her too. Cool Tita Santa. Happy Birthday. Happy Birthday to the best Auntie in the whole world.I have one sister(old maid) just like your sister. All the pamangkins love her for being so generous and kind hearted. She's so mabait, that's why she's loved! She deserves all the big hugs and kisses from her pamangkins! Tita Malu your one of a kind person. Thanks for sharing your blessings and I know God will give you many blessings too. Have a wonderful years. Ive become like that of some sorts, but mainly to my younger siblings. Since im the first born and still a bachelor. I love to treat my loved one's! It gives me a different kind of fullfillment. She's so generous and hsve a soft heart for her pamangkins .. Belated Happy Birthday na lang sa kanya. Belated happy birthday Santa Tita. Wishing you all the best in life Malu! Your kids are very lucky to have a generous and caring tita like your sister..Belated happy birthday Santa!Yahweh bless..